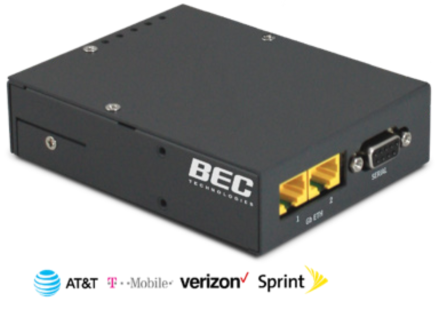 Silver Peak has partnered with BEC Technologies to create a joint solution that enables customers to incorporate robust, low-cost 4G/LTE CPE into any EdgeConnect deployment. Mobile network operators have largely completed the build-out of 4G/LTE infrastructure, making multi-megabit internet access delivered via the cellular network virtually ubiquitous across the US and major cities worldwide. Smartphone penetration has driven demand, and relatively inexpensive data plans now make it possible for network users to stream video and music, and interact with all manner of cloud-hosted applications and services over the mobile network. This has also given rise to an ecosystem of standards-based CPE devices which network managers can use to easily and reliably access LTE data services. Given these developments, enterprises are more frequently looking to incorporate LTE data services into their overall WAN architecture, particularly to support backup or tertiary connectivity at branch locations when wireline services have failed, or in locations where wireline services are not readily accessible. While in concept it's easy to augment branch connectivity with LTE, in practice it's not so simple. Simultaneously using multiple links for WAN connectivity (e.g. wireline, MPLS, broadband internet, 4G/ LTE, etc.) is the essence of a hybrid WAN architecture, and it is extremely difficult to build and manage hybrid WAN's using traditional routing technologies. Fortunately, enabling hybrid WAN deployments that include LTE links is one of the key capabilities of the Silver Peak Unity EdgeConnect SD-WAN solution. However, the WAN aspects of managing LTE links is only part of the problem. Even with the recent technological advances in LTE CPE and services, delivering a reliable data connection over LTE still requires specialized wireless technology. 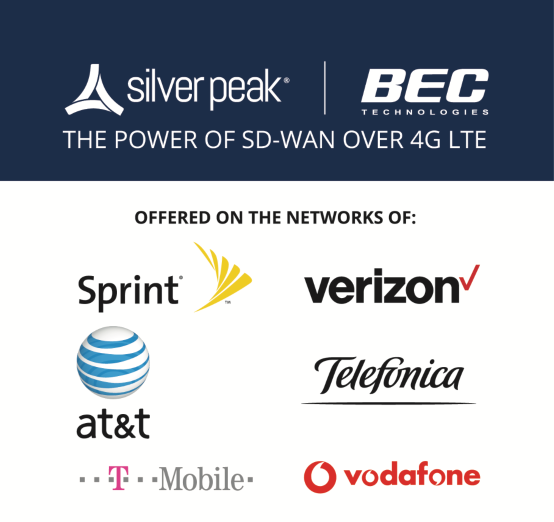 To address the challenges specific to the wireless link, Silver Peak has partnered with 4G/LTE specialist BEC Technologies to enable customers to easily incorporate BEC's MX-200* LTE CPE into EdgeConnect SD-WAN deployments. The BEC MX-200 4G/LTE Router is high performance wireless router enabling fast, reliable and secure LTE connectivity for any EdgeConnect deployment. The MX-200 device connects to a WAN interface on the EdgeConnect appliance, enabling the MX-200 to be easily physically located within the branch office in an area with favorable LTE RF coverage. This is a significant advantage over solutions which directly integrate LTE into the SD-WAN CPE, because the deployment location for WAN edge devices (e.g. wiring closet, basement) is frequently not ideal in terms of LTE signal coverage. From the perspective of the EdgeConnect SD-WAN, the LTE connectivity provided by the MX-200 presents itself as another WAN interface; LTE underlay links are integrated into the SD-WAN fabric just like any other WAN service. All the capabilities of the EdgeConnect solution are supported on LTE links, including packet-by-packet link bonding, dynamic path control, path conditioning and Unity Boost WAN Optimization. EdgeConnect also incorporates sophisticated NAT traversal technology that eliminates the requirement for provisioning the LTE service with extra-cost static IP addresses. Figure 1: EdgeConnect Hybrid WAN including BEC MX-200 4G/LTE CPE. * This solution brief applies to both the BEC MX-200 and M-100 systems. The only distinction between the MX-200 and M-100 is with respect to international geographic certifications. The systems are otherwise identical in terms of how they are deployed with EdgeConnect. To ease readability, this document refers only to the MX-200, however it is equally applicable to the M-100. Like EdgeConnect, the MX-200 devices are centrally managed. BECentral, BEC's industry-leading cloud management platform allows network providers and end users to get real time visibility into LTE network functions and performance. BECentral's capabilities include remote firmware update scheduling and loading, a 60-day history of RF parameters, heart-beat, remote restart, reporting of data usage with configurable limits, and text, e-mail and phone call notifications and alerts for various LTE-specifc conditions. Silver Peak and BEC work with a select group of wireless resellers who provide MX-200 hardware and installation services, post-sales support, LTE rate plans and consolidated billing for the LTE service. The MX-200 is certified with the four major mobile operators in the US: AT&T, Sprint, T-Mobile and Verizon. For Silver Peak customers who have pre-existing LTE services, the installation and commissioning of the MX-200 is as simple as installing the SIM card. Outside the US, the MX-200 is certified, sold and supported in most major geographies worldwide. BEC has working relationships with major international operators such as Telefonica, Vodafone and T-Mobile. BEC Technologies is a leading developer and manufacturer of 3G, 4G/LTE wireless broadband networking solutions for mobile operators, residential, enterprise and Industrial markets. BEC's comprehensive product portfolio of solutions incorporate Rugged Outdoor and Industrial/M2M Connectivity, Public Safety, Fleet/Telematics and Cloud based remote device management. BEC solutions are designed for high availability, reliability and secure connectivity all backed up with class-leading technical service and support. For more information visit www.bectechnologies.net.